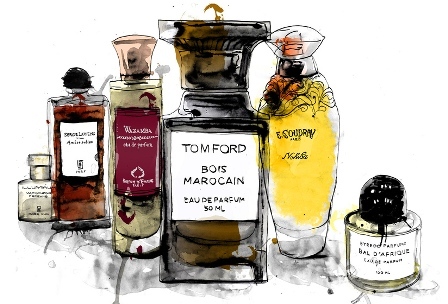 I love this niche perfume illustration. Mainly because it has one of my favourite perfumes in it – Bal D’Afrique by Byredo. Having discovered Byredo only recently, I’ve fallen in love with the brand. I have five of their fragrances in my store but I would love to have them all. You can smell the quality in each bottle. Bal D’Afrique has top notes of bergamot, lemon, neroli, African marigold and bucchu. Middle notes are of violet, jasmine petals, cyclamen and base notes are black amber, musk, vetiver and Moroccan cedarwood. We have this beauty in stock if you would like to try it.